Last week I showed a list of signatures, members of Zion Lutheran Church, Schumm, back in 1849. Not to be outdone by Zion Schumm, Zion Chatt also has an old membership list in their old church register. These names appear to be the original signatures since the handwriting is different for each person. A big difference between the two lists is that Zion Chatt’s list also includes the names of the women members. Often, but not always, the husband and wife’s names are on the same line. Unfortunately, Zion Chatt’s list does not have a date on it but it was included with their first constitution, so I imagine it would date to about 1855, possibly into the early 1860s. As are Schumm’s signatures, Zion Chatt’s signatures are difficult to read and, just to make it a little more challenging, someone put a line through many of the names when that person died or transferred to another church. 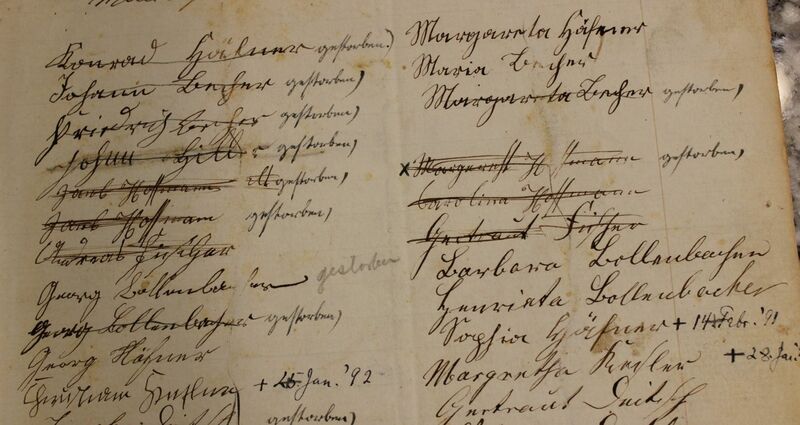 The notations after some of the names indicate the person died or left the church. This may be another opportunity to see you ancestor’s signature, if he/she lived in the Chatt area in the mid-1800s. Zion Lutheran, Chattanooga, Ohio, early members’ signatures, c1855-60. I enjoy looking at these old signatures and seeing the different handwriting. Look at that!!! There’s my gg grandfather Johann Jasper Byer aka Jasper Byer. Thank you for providing the photo!! Great to hear from you Andy! 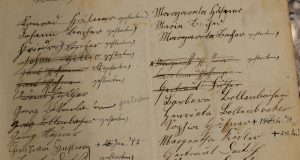 Isn’t is something to see your ancestor’s signature? So glad you enjoyed the post and thanks for writing. I have the old register from Mt. Caramel Jefferson Twsp. We were members there till it closed and we moved our membership to High Street Methodist in Geneva. Those old registers are so interesting! Great to hear from you! The Heffner’s had the German spelling of Hafner! Interesting! They spelled the name several different ways over the years. It depended on who was doing the writing. That was the case for many other surnames, too. Thanks for writing!